Interior decorating is more and more becoming a technology based process. And this is all good when it comes to searching for resources (or designers!) that may not be right in our own back yards. But, there is a real problem with technology and picking paint colors. It just shouldn’t be left to computer screens, iPhone apps or even the pages of a magazine. In other words, if you see a color you love, don’t assume it will look at all in person how it looks in the image. Take, for instance, the image above. This is probably the third post I’ve shared this image in because I love it so much. 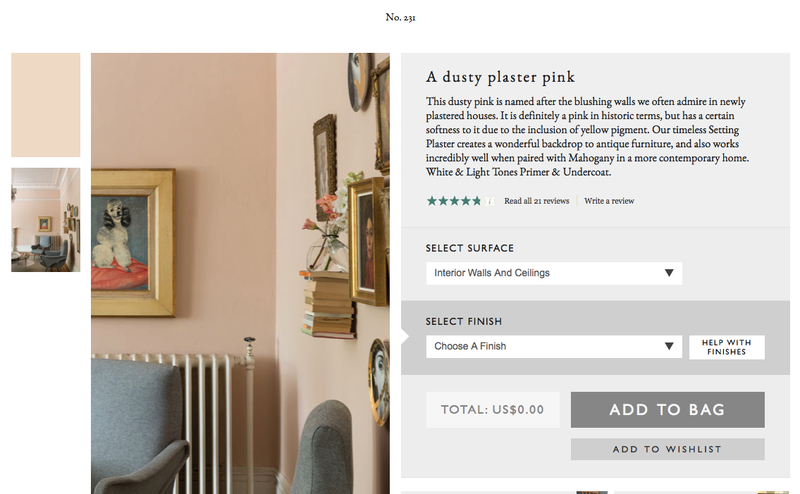 The pink paint color in the bathroom is listed as Farrow & Ball’s “Setting Plaster”. After painting much of my own cottage a much deeper and brighter shade of pink, I was having second thoughts. And started obsessing over the color to the point where I decided to search for other spaces that have used this beautiful paler shade of pink. What I found was fascinating and perfectly illustrates the problem with technology – in other words, how images are digitized and how different screens render the colors differently. As you can see – all of these images show a different shade of pink. Some are a little muddy like the fireplace image above and others are show a much clearer hue, as in the photo right above. This photo above looks pinker at the top and trends more beige as you move down the wall, to the molding and table. The color is back to being a little more muted in the space above – possibly because it’s been painted on a plaster wall. And the image above we see a paler, cleaner pink again. And on it goes. Each space shows a different shade of what is supposed to be the same color. In the image below, taken from F&B’s product page, the top thumbnail is more beige to orange than the room shot image appears. And I took this second image with the palette lying flat on the window sill. In both cases, the chip shows a color that is beige, a pinky beige to be sure, but beige nonetheless. As a matter of fact, it’s what I would call “Ace bandage” beige. And yet, how beautiful is it in all these photos?? When I’m picking paint colors, I usually do search for rooms painted that color on Google, Pinterest and Houzz just to see how it looks in room size scale. But nothing will ever beat buying a sample pot and painting it right on your own walls to be sure. Seriously, who is a better decorator than Mother Nature? Thanks Mary Beth – you too! Check your post! It malfunctions in the middle! that pink is the best……as so is Calamine…I used in my granddaughter’s bedroom here in Montecito…it is heavenly! I will repost the color! Most pins are way to bright in person on the wall! YKES!!!! One of my fave things about Farrow and Ball is their “sample pots” ! I could not decorate without them! You put the sample up on the wall….and look at it all day long…and at night! Different colors I would swear….are the same colors in a house because of the light! Be sure to use “sample pots” before you pick a color!! I just had this experience. Picked the perfect color off of more than one Pinterest image. Well what I thought was a soft gray blue was definitely more green. So far I’ve purchased 5 sample pots, painted on white cardboard and will look at them all in different areas and different lighting. I’m hoping for the best as it’s a large area I’m having painted and it will be expensive to make a mistake. It’s tricky Nancy! But it sounds like you’re going through all the right steps.